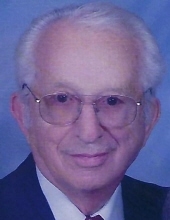 Clarence C. Sapienza, 99, of Peru, passed away very peacefully Sunday, April 14, 2019 at his home, surrounded by his family. A prayer service will be held at 11:30 AM Wednesday, April 17, 2019 at the Mueller Funeral Home, Peru followed by Mass of Christian Burial at 12:00 Noon at Queen of the Holy Rosary Church, LaSalle with Rev. Ronald Margherio OSB officiating. Burial will follow in Peru City Cemetery with full military rites conducted by the Peru Veterans Memorial Group. Visitation will be 9:30-11:30 AM Wednesday at the funeral home. Mr. Sapienza was born November 6, 1919 in LaSalle to Angelo and Della (Chrison) Sapienza. He was a graduate of LaSalle-Peru High School and received Bachelor’s and Master’s Degrees in Education from Bradley University. He married Myrle M. Braun on December 25, 1942 at Queen of the Holy Rosary Church, LaSalle. Mr. Sapienza had a deep love for God and country. He served in the 8th Army Air Corps as a belly gunner in a B17 in England during World War II. He began his career in education as a teacher at a one-room schoolhouse in Sprinkleburg in Putnam County. He later came to the Oglesby Public Schools where he served as a teacher, principal and retired as superintendent. His love of education was also reflected in his love of reading. He also enjoyed playing cards. Mr. Sapienza was a member of Queen of the Holy Rosary Church, LaSalle and St. Joseph’s Church, Peru. He was also a member of the Illinois Retired Teachers Association, the Oglesby Elks Lodge 2360, the LaSalle Veterans of Foreign Wars and the Springfield American Legion. He enjoyed fishing and had a magic touch for catching fish. The highlight of his life was his house in Minnesota that he and his wife lovingly shared with their family and friends. Survivors include his wife of 76 years, Myrle; his son, Mike (Jacqueline) Sapienza of Peru; two grandchildren, Laura (Mike) Hollerich of Dallas, TX and Michael (Erin) Sapienza of Highland; several great-grandchildren and numerous nieces and nephews. He was preceded in death by his parents and two brothers, Dominic and Joseph Sapienza. Pallbearers will be Jason Thompson, David Thompson, Mark Holcomb, Roger Thompson, Greg Boggio, Kevin Heisley and Andy Ivakhnenko. Memorial contributions may be directed to the family for a memorial scholarship to be established at Illinois Valley Community College. To send flowers or a remembrance gift to the family of Clarence C. Sapienza, please visit our Tribute Store. "Email Address" would like to share the life celebration of Clarence C. Sapienza. Click on the "link" to go to share a favorite memory or leave a condolence message for the family.